After about five and a half hours of sleep, I woke up for breakfast over the Gran Chaco of northern Argentina. The semi-arid lowland is a beautiful part of the Río de la Plata basin, and spreads out across eastern Bolivia, Paraguay, northern Argentina and a portion of the Brazilian states of Mato Grosso and Mato Grosso do Sul. After finishing breakfast the terrain changed to the green pastures of the Pampas, the infamously fertile South American lowlands that are home of some of the best beef in the world, and pastures that stretch across Argentina, Uruguay and southern Brazil. Not long afterwards, we flew over a large urban area that could only be Buenos Aires. We landed at Aeropuerto Internacional Ministro Pistarini, also known as Ezeiza airport, around 8:45. Ezeiza serves at the main international gateway to Argentina and is located about 13 miles southwest of the city. After passing through customs and collecting our luggage, we took a taxi to the city to our hotel. We dropped our bags off at the Aspen Towers Hotel (http://www.aspensuites.com.ar), located between Calle Paraguay and Calle Esmeralda in the Retiro neighborhood. The hotel is nice and catered to business travelers. It is located about two blocks from the Florida Street pedestrian mall and is convenient to Jorge Newbery airport (about 10 minutes away), where we would flying from on Monday. We grabbed lunched nearby at a food court inside the beautiful Galerías Pacífico shopping centre located off Calle Florida. Florida is one of the city’s leading tourist attractions with its malls and restaurants not far from the financial district. We had some really good Argentine sausages for lunch. It’s really about the beef in Argentina. We had a lot to see in a short period of time, but we took a moment to admire the Beaux Arts mall that dated back to 1889 and was modeled after the Le Bon Marche in Paris. Part of the building was previously home to the Museo Nacional de Bellas Artes. 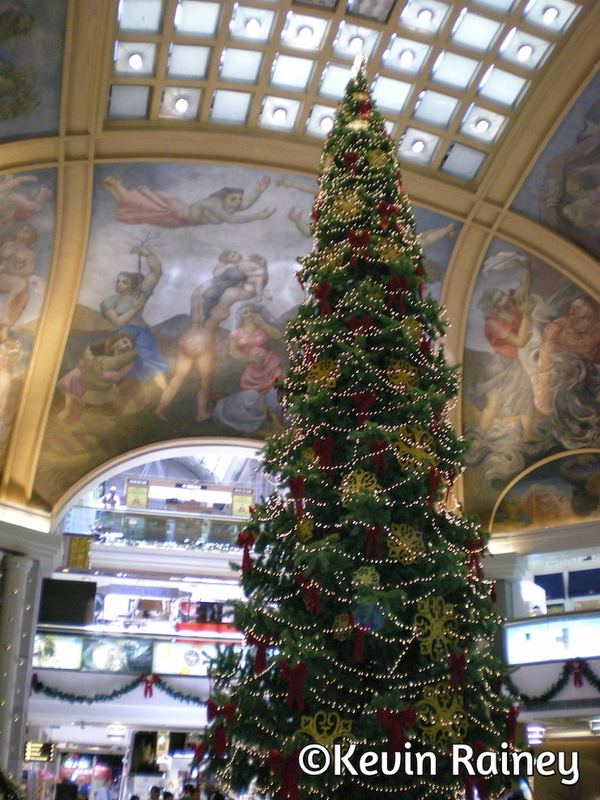 The huge gallery domes in the central cupola today were hosting huge Christmas trees under their opulent frescos. The building also has a dark side. During the dirty wars, the military junta used secret rooms in the building as a detention and torture center in the late 1970s and early 1980s. Then we had a bit of a problem. Most of the ATMs in Buenos Aires had secure doors you had to scan your door to get inside. Our cards wouldn’t let us in! Eventually we found an ATM we could get to buy card wouldn’t work … I realized I made the mistake of not calling my bank and Visa about lowering the fraud guard while I was in South America. Thankfully Jeff was able to get money out. We decided to take the subte to La Boca neighborhood. The Subte is the name of the subway in Buenos Aires. It first opened to the public in December 1913. It was the first metro in South America, the Southern Hemisphere and the Spanish-speaking world. That’s when we ran into another problem. The machines would take our large note Argentine peso bills that amounted to about $20. The attendants also would change them because they said they were too big. We decided to take a taxi to La Boca until we could later get around the change problem. La Boca, or the mouth, is so named because it sits near the mouth of the Riachuelo-Matanza near the River Plate. It’s where the city started and is a little bit like BA’s Ellis Island. Many immigrants originally came to here from Europe, in particular, Genoa, Italy. In 1882, La Boca ceremonially ‘seceded’ from Argentina during a strike. Today, it is still a center for radical politics and was one of the battlegrounds during the 2001 economic depression in Argentina. La Boca is a very colorful area thanks to its history. We saw a number of colorful buildings and all along the pedestrian street, the Caminito, we saw an attraction people from all over the world come here to see. 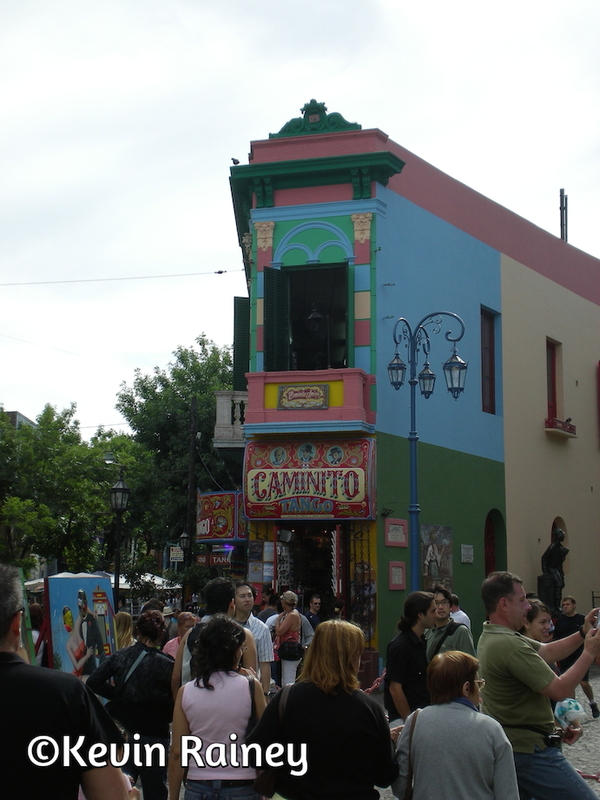 La Boca is where tango was born in the bordellos. Today, tango has shed its dubious past but remains a seductive dance widely appreciated as perhaps the most beautiful dance in the world. 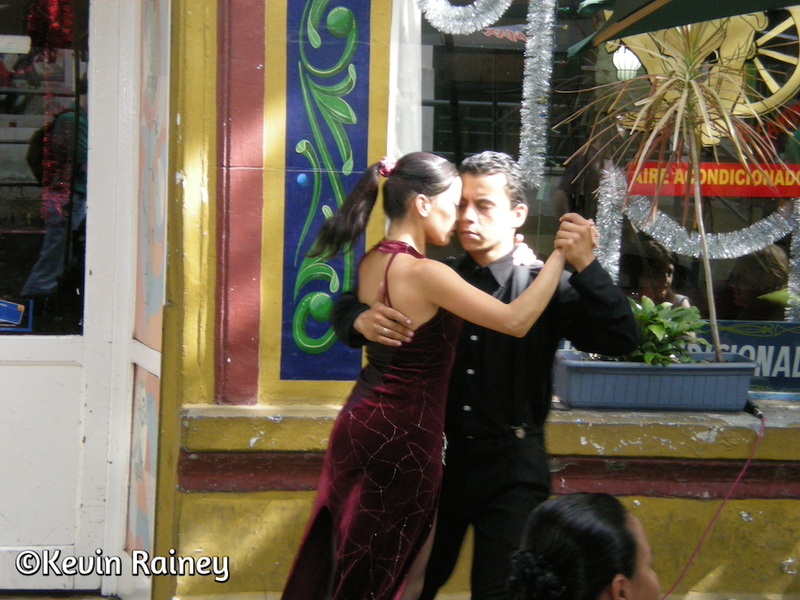 We saw a number of artists performing along the Caminito and heard the constant chords or accordions playing tango classics like La Cumparsita or Mi Buenos Aires Querido. We also saw the La Ribera theatre, a number of tango clubs and Italian taverns. We didn’t have time for tango lessons, but I am not sure that would have been a good idea with my two left feet. However, we did stop by and admire the Boca Juniors stadium, Estadio Alberto J. Armando, popularly known as La Bombonera (the chocolate box). 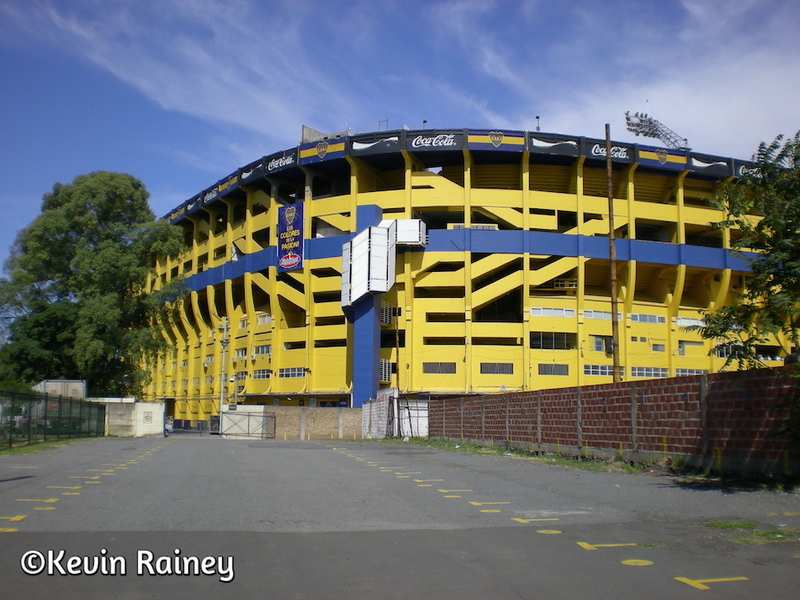 Boca Juniors, along with their city rivals, River Plate, at two of the most famous futbol teams in the world. Then we bought some Argentine souvenirs in La Boca such as yerba maté tea gourds and bolas (ball lassos the gauchos use). We decided to walk to the Plaza de Mayo – quite a haul through the San Telmo neighborhood. We walked through the Feria de San Telmo at Plaza Dorrego – a Sunday market. We saw vendors hawking all sorts of antiques, crafts and other items from their stalls extending down the cobblestone Calle Defensa. We even saw some street performers, tango dancers and hundreds of artists. The Plaza de Mayo has been a hub of political life in Argentina since being the scene of the 25 May 1810 revolution that led to independence. It’s here that some of the famous mothers of the Plaza de Maya wore their white scarves and marched in defiance of the dictators to support their disappeared children. They continue to advocate for information about what happened to their children during the Dirty War military dictatorship between 1976 and 1983. We took several photos of the most famous building on the plaza, the Casa Rosada, which is the executive mansion and office of the President of Argentina. President Nestor Kirchner actually lives at the Quinta de Olivos which is located in Olivos, Buenos Aires Province. 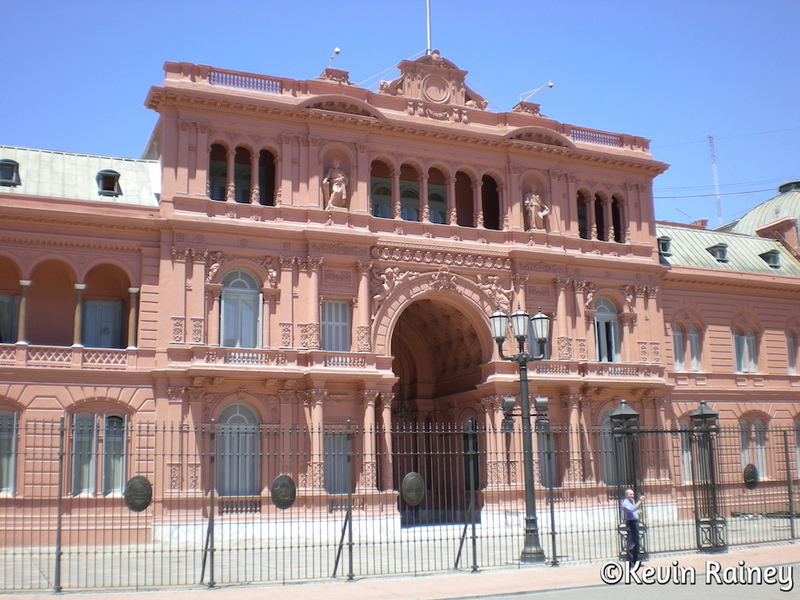 However, this pink mansion remains the most famous building in Argentina. We could see the famous balcony where President Juan Perón and First Lady Eva Peron made speeches. Contrary to Andrew Lloyd Weber’s Evita, Eva never addressed the public for her final speech from the balcony in 1952, nor did she ever say “don’t cry for me, Argentina. Behind the Casa Rosada, we saw the Cristobal Colón (Christopher Columbus monument). In the front of the Casa Rosada on the Plaza, we took photos of a huge Argentine flag flying over the Pirámide de Mayo, the oldest national monument in the City of Buenos Aires built in 1811 on the first anniversary of the May Revolution. The pyramid is crowned by a statue of the figure Liberty, the work of the French sculptor Joseph Dubourdieu. 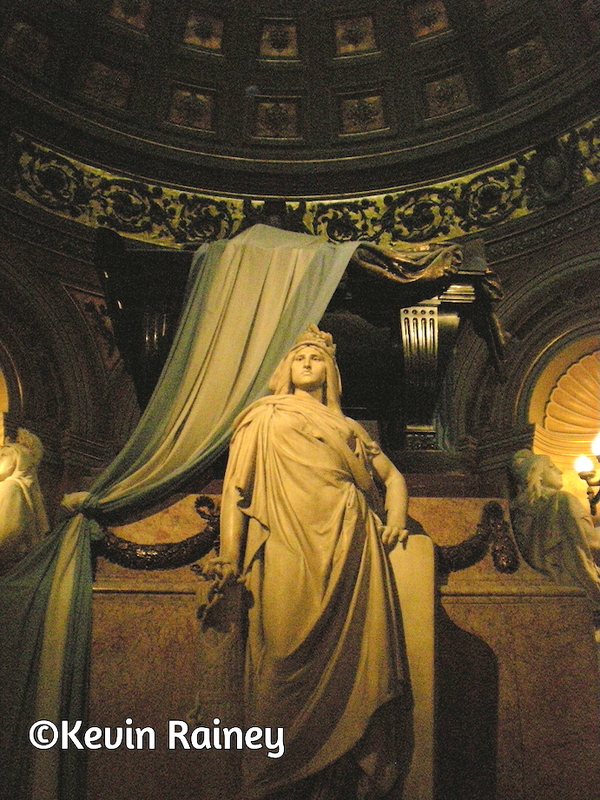 On the plaza, we walked into the Catedral Metropolitana de Buenos Aires, the main Catholic church in Buenos Aires and head of the Archdiocese of Buenos Aires. It has been rebuilt several times since the 16th century, but the present building contains an 18th-century nave and dome, and a 19th-century Neoclassical façade. The interior is a mix of Neo-Renaissance and Neo-Baroque decoration. Most notable inside, we saw the spectacular marble Mausoleum of General José de San Martín. The liberator and military hero’s black sarcophagus is guarded by three life-size female figures that represent Argentina, Chile and Peru, three of the regions freed by the General. The Mausoleum also contains the Argentine Tomb of the Unknown Soldier. After visiting the Plaza de Mayo, we walked to the Perú subte station. Again we had a problem with change. So we resorted to an old trick: we went to dinner at McDonalds. They always change large bills! When we finished dinner, we entered the beautiful subte station. With beautiful paintings, this is considered one of the most elegant of the subte stations with little changed during the last 95 years. The reason we came to this particular station was to do something truly unique. We rode vintage wooden train cars that only run on Línea A. This creaky and clacking wooden cars we almost 100 years old but really beautiful pieces of work. However, I don’t think I would want to be in one during a collision! 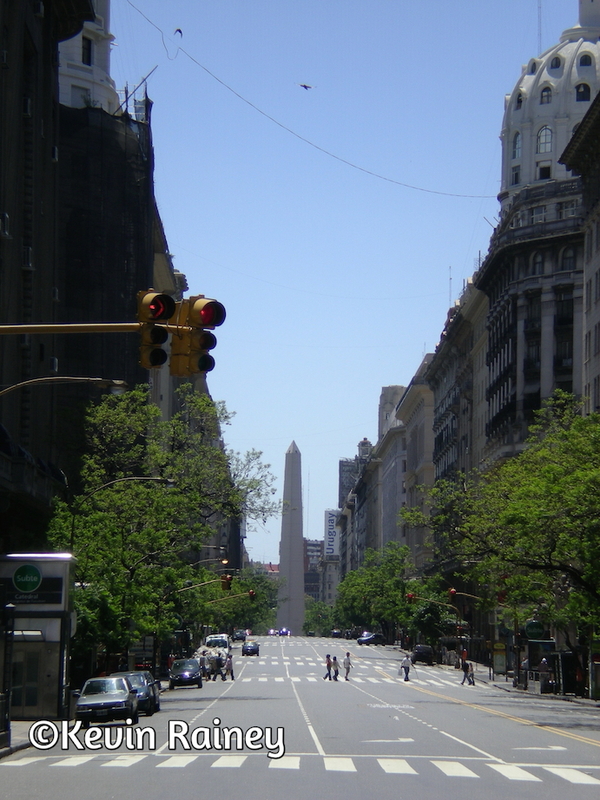 After exiting at Avenida 9 de Julio, we were in awe of the widest avenue in the world. Its name honors Argentina’s Independence Day, July 9, 1816. Seven lanes run each direction, and it is flanked on both sides by parallel streets of two lanes each. I attempted to run all the way across on the green arrow, but it was impossible to make it all the across. 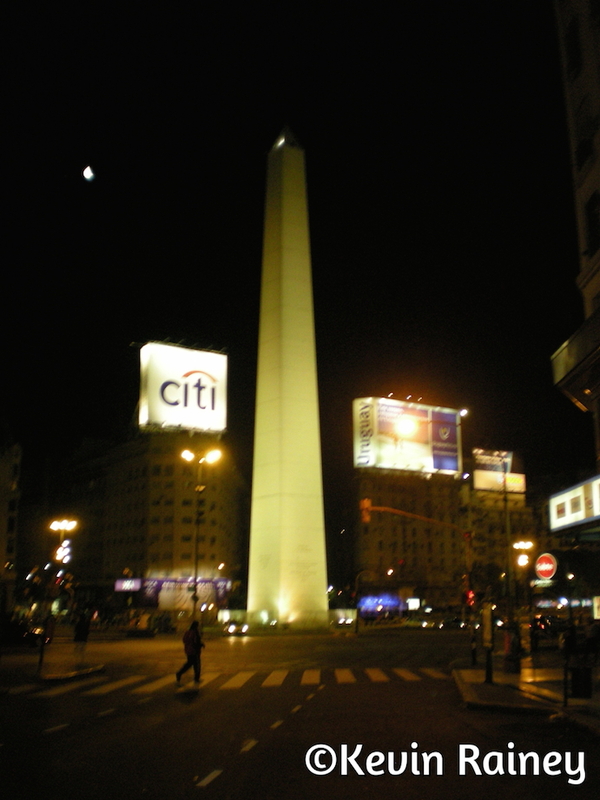 Then we walked up 9 de Julio to the Obelisco, the famous obelisk and icon of Buenos Aires. 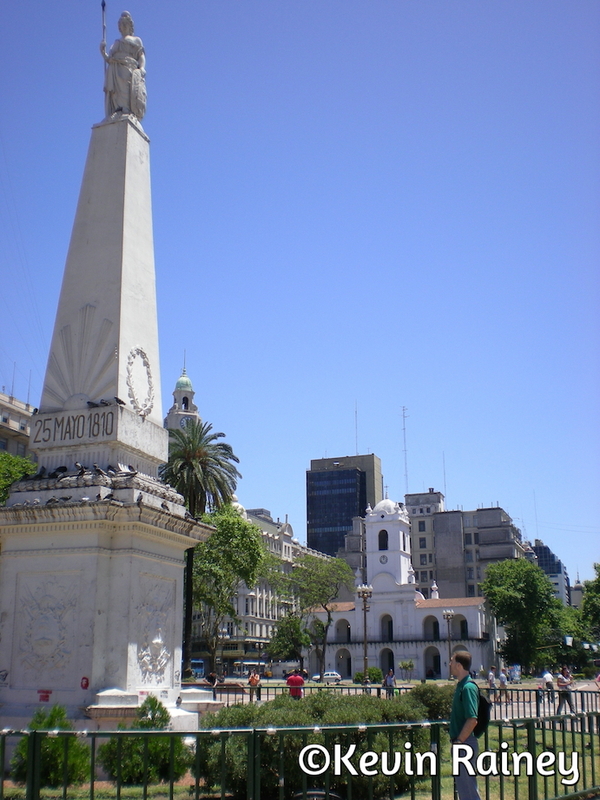 It is located in the Plaza de la República, at the intersection of avenues Corrientes and 9 de Julio, and commemorates the fourth centenary of Buenos Aire’s founding. The city has developed led lighting on the avenida around the surrounding theaters to make it appear like Times Square or Picadilly Circus. It was beautiful and buzzing at night with traffic. We also saw the Teatro Colon, which was undergoing an exterior renovation. 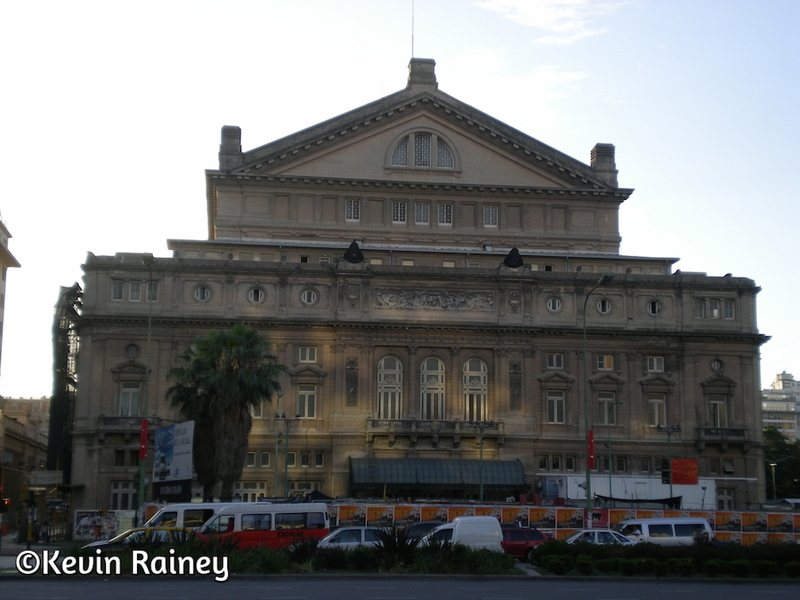 The theatre is one of the most famous opera houses in the world. Afterwards, we took the Subte Línea D (Diagonal Norte) to the upscale Palermo neighborhood. Upon exiting at Plaza Italia, we walked a loop down around Parque Palermo and back. It was really pretty under the leafy trees and the lights of the neighborhood were gorgeous. Jeff and I each bought a cone of Dulce de leche gelato. Amazingly good! Then when took a taxi back to our hotel. We were worn out!